Can I Feed my Dog “People Food”? After months of planning and searching you finally bring your sweet little fur-ball home. You’ve done everything right. You’ve crate trained him, you’ve made sure he has the softest bed, the chewiest toys, and you’ve found the greatest trainer of all time. After two weeks of raging success, you happen to walk past as your oldest child passes your puppy a (gasp!) big ol’ juicy piece of cheddar cheese. You can feel it all unravelling. Your strict mantra of “no people food” has forever been broken! Now that your puppy has had a taste for the real thing there’s no turning back. He will forever scorn your offerings of high-end kibble and demand second helpings of filet mignon with a side of gravy. Not to worry. Things aren’t as bad as they seem. Let’s take a look at why and how “people food” can actually do far more good for your training process than harm. Most “People Food” is better quality than half the kibble your dogs are getting anyway. I hate to break it to you, but a huge number of dog food brands are jammed with stuff you don’t even want to know about. As long as you’re not giving your dog cajun chicken stuffed with jalapenos and dark chocolate, then he will likely be better off with some human quality food in his belly! Stick to stuff that won’t upset his stomach, though (like boiled chicken, cheese, liver etc), and he’ll think his life has finally begun. It’s not about WHAT you give it’s about WHEN you give it. 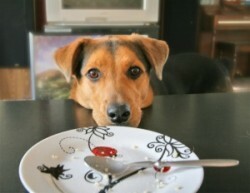 Dogs don’t beg at the table because they’ve developed a taste for meat, like some kind of fur-vampire. They beg at the table because you give them food from the table! Instead of reinforcing the behaviour of begging by giving tidbits while you eat, cut the meat up into small bits and use it for your training sessions later. Or, put a little bit IN HIS BOWL away from the table and ask him to give you a nice polite sit before he gets it. I always tell my clients, “If you use kibble, you will get kibble responses”. Using bits of leftover ground beef, however, will leave you with a super motivated, eager puppy that’s ready to work. Use “People Food” to add some interest to his kibble. So if your dog’s taste buds have been inadvertently enlightened, don’t despair! Nothing in dog training has to be a hard and fast rule. Instead, try to think of ways to use these things to your advantage. There’s no such thing as “People Food”….it’s all just food! Happy leftovers!! !